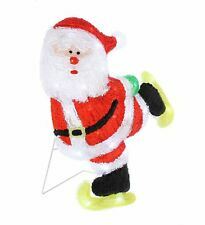 Ceramic LED Light Up Colour Changing Santa Father Christmas Ornament With flashing colour changing LED Lights Size; 17 x 9 x 7cm Makes a lovely Christmas novelty ornament / Decoration Batteries included. Iscriviti alle news!ISCRIVITI. I prodotti devono essere restituiti in condizioni di sostanziale integrità. 66100 Chieti Scalo, CH - Italia. Via Per Popoli, 254. Publilancio S.r.l. BORSE E SACCHE MARE. Villaggio elettrico santa claus musicale. A lovely light up Christmas Santa log scene. Just without its original box. A Beautiful Snow globe with Festive Tree and Father Chritstmas at the Christmas Tree with Santa's helper. All made by Heaven Sends. Train runs round the base. Lights up and changes color. This light can be personalised with up to 20 characters. This LED Santa stop here night light is the perfect way to let Santa know where to stop this Christmas. This light is colour changing and can be changed with a simple touch to the base. This battery operated Light-up Santa Hat is constructed from polyester and features a white plush trim and pom pom. Light-up Santa Hat. Material: - Polyester and Plush trim. Pull tab underneath and flick switch to on/off. No batteries required. A truly lovely piece which can be displayed year after year. This light can be personalised with up to 20 characters. simply personalised. This LED Santa stop here night light is the perfect way to let Santa know where to stop this Christmas. This light is colour changing and can be changed with a simple touch to the base. Make sure Santa knows exactly where to drop off your presents with this quality wooden ‘Santa Stop here’ sign. Illuminated by six Green & Red LEDs, which glow out warmly through the scroll text, this sign is sure to inject a healthy dose of feel good festive cheer into your home. The sign is constructed from quality wood with a white washed finish, providing a charming rustic effect. Made from ceramics and hand painted to a wooden look finish. H 23 cm x L 14 cm x W 11 cm. BT (Northern Ireland) IM (Isle of Man) & Channel Isles. Choo Choo! Looks great on a shelf or in a window and depicts a more traditional Santa. Pads on the base to protect your surfaces. You can rely on us for quality, efficiency and good old-fashioned service. Led flashing Christmas necklace with lightbulbs. 3 flashing nodes. quick dispatch. Add to the fun spirit of your Christmas festivities with a rather stylish block decoration. Lovely beige wood block with contrasting gold glitter letters that just shouts 'HO HO HO'! Battery operated. Kids of all ages will love it. Batteries included. Switch on and watch this delightful Father Christmas shine. Features LED lights inside which snine through the little cut out stars. You can rely on us for quality, efficiency and good old-fashioned service. Each set comprises 1 Red Santa Pen, 1 Green Christmas Tree Pen and 1 Blue Snowman Pen. Set of 3 Light Up Christmas Ball Pens. 1 x Set of 3 Light Up Christmas Ball Pens. All pens are Blue Ink. Your Right to Cancel ?. 18cm Table Top LED Train. 18cm x 11cm x 16cm. >> String Lights. > Christmas Lights. > Christmas Trees. >> Icicle Lights. >> Cluster Lights. >> Rope Lights. Get your writing into the Christmas spirit aswell with this festive biro style pen. Not suitable for children under 3 years of age. Christmas Concepts® Light Up Santa Earrings - Flashing Jewellery - Novelty Christmas Dress Up These Flashing Santa earrings will look fabulous at any event you have coming up this Christmas. The perfect way to get in the festive spirit! GOOD CONDITION. TESTED AND WORKING, NEEDS 2 X AA BATTERIES. This decoration is fully lit with Santa Claus on an Illuminated Rope. Height of Santa: 90cm high. Suitable for Indoor and Outdoor use. WeRChristmas Babbo Natale incastrato nel camino Lampeggiante LED Luce Corda Silhouette,.